Koren Georgijević Oganesian (Armenian: Խորեն Հովհաննիսյան, born on January 10, 1955 in Yerevan, Soviet Union) is a former Armenian and Soviet football midfielder, player of the USSR national football team. 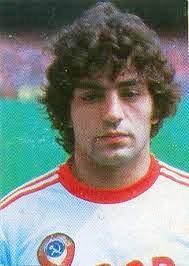 At the club level, he mostly played for club Ararat Yerevan. In November 2003, to celebrate UEFA's Jubilee, he was selected as the Golden Player of Armenia by the Football Federation of Armenia as the most outstanding player of the past 50 years. NOTE: All credits go to Dimonspa, I only fixed some things that the set fits to the forum standards. By the number of goals, Khoren Oganesyan surpassed me. My advantage was that I almost did not hit 11-meter shots, and scored all my goals from the game, and he scored about 30 goals from the penalty spot. He should have among Penalties among S.A. and cards. This set should be reviewed in the future as well, maybe I'll find the time to watch some games from him after I'll finish the stats for the 1973 Ararat team.